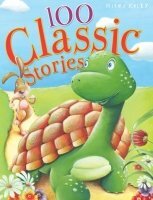 100 Classic Stories contains 100 much-loved classic tales, including Snow White and The Three Little Pigs. Every page is lavishly illustrated by renowned children's artists to bring famous characters to life for children aged 4–9 years. • Stories have been simply retold for your young child, so they can read along as they gain confidence. • Specially commissioned artwork throughout brings characters and events to life. • Split into section for 4–6 years and 7–9 years to help you choose suitable stories.